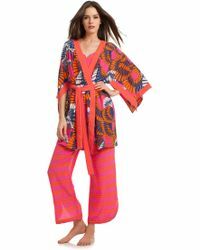 California label Trina Turk has the Golden State written all-over it, from the active styles to the bright, vibrant colours. The label was launched in 1995 by namesake designer Trina and her husband and has channeled an aesthetic of carefree glamour and fashion conscious designs ever since. The brand now encompasses a very wide range of lines, including the selection of nightwear, featuring pyjamas and dressing gowns.